Our products are available here for download in Shareware versions. You can freely download and install these versions on your computer for evaluation. This method allows you to try our products before you purchase them. If you have found the software to be useful, please purchase a license. To purchase a product, see the Purchase section. After your order and payment, you will receive registration code via the e-mail and full download address. If you are an existing customer and got an error that said "Can't load LameEnc.dll", feel free to contact us for getting a FREE upgrade. The contained MIDI converter in evaluation edition is demo only, registered version includes a more powerful and functional MIDI Ringtone converter. You will see a window titled "Security Warning". This is normal on Windows XP SP2. If the internet connection has been terminated before the end of the download (size does not match) or if the download procedure returned damaged data (it may happen during a connection) then the install procedure will fail returning an error message. Delete the downloaded file from your hard drive. Then try to download the file from the same source. 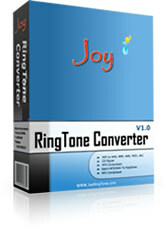 How to Install Joy RingTone Converter? Run the installation program(joyRingtone.exe), follow the instructions that appear on the screen. How to Uninstall Joy RingTone Converter? Run the uninstallation program, Or open the Control Panel folder and double-click the Add/Remove Programs icon. Select Joy RingTone Converter from the list, then click the Add/Remove button. Follow the instructions that appear on the screen. Copyright © 2005-2009 Joy RingTone Software, All rights reserved.